January 8 - Happy Birthday, Elvis! 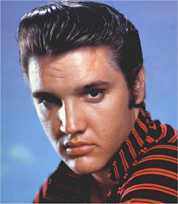 Elvis Aron Presley was born in Tupelo, Mississippi on January 8, 1935. Beginning the age of 21 -- with his first No. 1 hit, "Heartbreak Hotel" -- he rose to become one of rock's most enduring legends. Although Elvis tragically left us at the age of 42 back in 1977, he still remains in the hearts and minds of millions of fans around the world. This year, watch for the Elvis All-Star Tribute Special to be televised on February 17, 2019 on NBC beginning at 8PM ET. Hosted by country singer Blake Shelton, it will feature an all-star performance lineup with Keith Urban, Post Malone, Jennifer Lopez, and John Fogerty among the artists set to perform some of Elvis Presley's most popular songs. Other musical guests will include Ed Sheeran, Dierks Bentley, John Legend, Josh Groban, Carrie Underwood, Yolanda Adams, Darius Rucker, Mac Davis, Adam Lambert, Shawn Mendes, Alessia Cara, Kelsea Ballerini and the Pistol Annies. The TV special is being aired in honor of the 50-year anniversary of the famous special "Singer Presents …. Elvis" that aired in 1968, marking the King's comeback and relaunching his career. Other guests will include Priscilla Presley, Lisa Marie Presley, and Steve Binder, director of the original "Comeback Special." His amazingly versatile voice won him countless admirers, and his generous warm nature along with his handsome good looks has ensured his renditions of many of the most loved songs ever written will continue to attract discerning listeners. Elvis movies also managed to win the hearts of generations of moviegoers young and old. Unique in many ways, Elvis lived an enigmatic life which even to this day attracts the efforts of countless biographers, from close friend's reminiscences, to academic investigations. A legend in his own lifetime, Elvis has also become the icon of an era. His voice, at it's very best, has an uncanny addictive nature. No wonder millions of people once ensnared, rarely escape it's seductive tones - even if they wanted to. Most recently, the 80th anniversary of Elvis' birth was celebrated in 2015 at his famous home in Graceland. The day was marked with special Graceland tours, Elvis fan club get-togethers, guest performances, and other rockin' musical tributes in honor of The King. • In 1956, just before Elvis' first major television appearance on the Milton Berle Show, the host advised the fledgling rocker to perform without a guitar, adding "Let 'em see you, son." And the rest, as they say, is history. Elvis' gyrating hips caused a sensation nationwide, earning him the nickname Elvis the Pelvis. • Elvis' natural hair was sandy blond, but as a teenager he began dying it black to look cool. • Elvis was famous for his unusual food cravings, but his No. 1 favorite was the peanut butter-banana-honey-and-bacon sandwich. • With the Beatles and the British music revolution, Elvis Presley's star began to fade in 1968 until he returned with a comeback television special that year simply titled "Elvis", which reignited his career. • Live concert fans were often entertained just as much by his music as his funny banter in-between songs. To find out what a live performance was like, check out the 1974 album, "Having Fun with Elvis on Stage". Graceland Mansion - The official site with information on ticket purchase and entry fees, special tours and packages, and a library of information, photos and video of the King. Elvis Presley - Wikipedia - Extensive biography with details on his professional rise and fall, personal details, family life and more with photos, related references and resources. History of Rock.com - Elvis Presley - Great read with childhood and personal photos, career highlights. Worldwide Elvis - Everything Elvis, with a long list of fan sites and information from around the planet.